The Coleman Lantern Company produced their Ker-O-Lite (Kar-O-Lite) non-pressurized kerosene table lamp from 1939 - 1941. The table lamp had a glass base, with a fired on finish. The Ker-O-lite was Coleman's only non-pressuized mantle lamp sold in the USA. It was introduced in the same era as the Aladdin Model B lamps. You are purchasing only the sock portion of the mantle. If your lamp is missing the frame for the mantle, an Aladdin R150 Mantle frame can be used. Great care must be taken to not touch the mantle fabric with your fingers while mounting to the Aladdin frame. 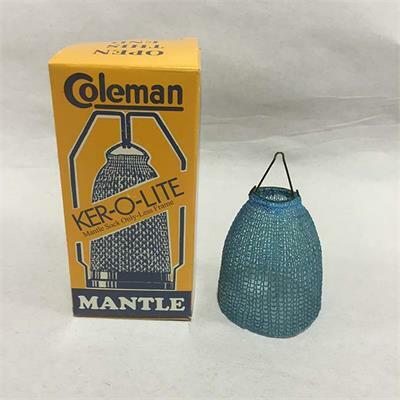 The Coleman Ker O Lite table lamp was also sold by Montgomery Ward. www.p65warnings.ca.gov. 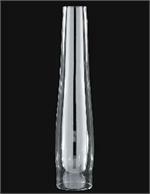 2 5/8" base diameter x 13" height 3/4 frosted glass lamp chimney. Fits many Rayo, B & H, and other Central Draft style lamps. 2 5/8 inch by 13 inch with 2 7/8 inch bulge, clear hand made chimney fits Rayo and CD burners. Designed for use with 10 inch and 11 inch ball shades.